Cook linguine according to package directions. Meanwhile, in a small nonstick skillet, cook garlic in butter and oil until golden. Stir in the lemon juice, Italian seasoning and shrimp; heat through. 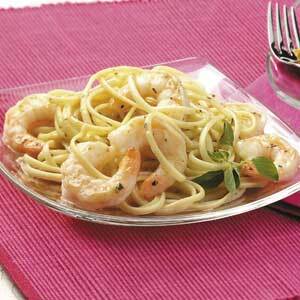 Drain linguine; toss with shrimp mixture. Looks really good, I’m going to try it with some Whole Wheat Pasta? This does sound great! I will have to try it too! This is now my quick run-to when I’m short on time. Love it! I just tried this….it was great!